M Nair, K Balagopal. 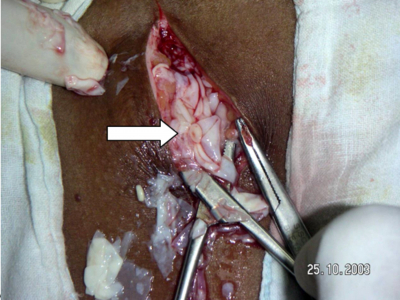 Hydatid cyst of the chest wall masquerading as cold abscess: A case report with literature review. The Internet Journal of Surgery. 2007 Volume 14 Number 2. To the best of our knowledge, this is the first case report in the literature of a hydatid cyst of the chest wall masquerading as a cold abscess. The striking resemblance between tuberculous cold abscess and hydatid cyst of the chest wall clinically and radiologically forms a diagnostic dilemma, particularly in those with a history of tuberculosis. To the best of our knowledge, this is the first case report in the literature of a hydatid cyst of the chest wall masquerading as a cold abscess. 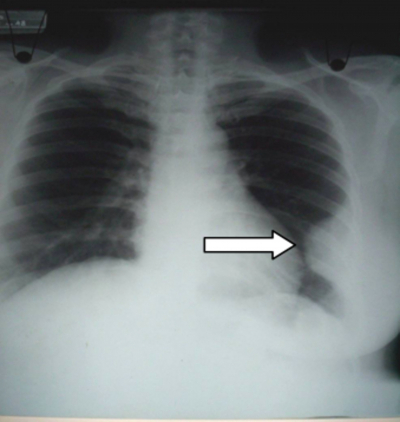 Primary hydatid disease of the chest wall is extremely rare. The striking resemblance between tuberculous cold abscess and hydatid cyst of the chest wall clinically and radiologically forms a diagnostic dilemma, particularly in those with a history of tuberculosis. We present the case of a hydatid cyst of the chest wall which masqueraded as a cold abscess in a patient with history of tuberculosis. A 48-year-old female presented to the surgical outpatient clinic with a swelling on the left side of the chest wall, of 3 months' duration. Ten years back, she underwent an incision and drainage for a swelling at the same site .She had received antituberculous therapy for pulmonary tuberculosis twice in the past, 10 and 6 years back. There was no other significant past medical or surgical history. There was no history of close contact with pets/animals. On examination, there was an 8x6 cm, ovoid subcutaneous swelling on the left side of the chest wall, with a healed 6 cm transverse scar on the skin over the swelling. This swelling appeared to be fixed to the skin and the underlying ribs. There were no features of an acute inflammation. Her hematological and biochemical parameters were within normal limits, except for ESR, which was 30mm/h. 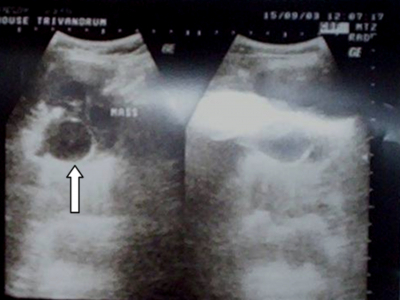 She had an X-ray of the chest, which showed a well circumscribed dense lesion on the left side (figure 1).The Ultrasound scan of the chest (figure 2) reported the presence of fluid with mixed echogenic particles, representing a cold abscess. 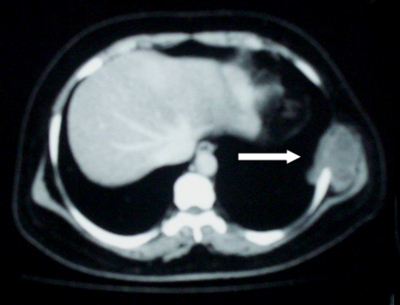 The CT scan of the chest (figure 3) showed the presence of cold abscess on the left chest wall, extending to the serratus anterior muscle. 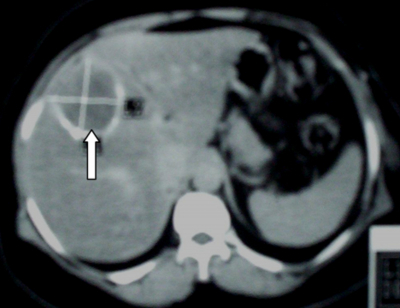 The CT scan of the abdomen (figure 4) noted the presence of an inactive focal lesion in the liver with peripheral calcification, which possibly represented an old granuloma. A non-dependent drainage was attempted under local anaesthesia. During surgery, white flake-like material, resembling piecemeal of tender coconut, were seen in the cavity (figure 5) .The cavity was curetted and cleared. A sinus was seen extending into the parietal pleura with destruction of two adjacent ribs. There was no breach of the parietal pleura. Finally the cavity was irrigated with saline and povidone iodine. The wound was closed with a low vacuum suction drain. The patient tolerated the procedure well without any complication. The postoperative chest X-ray did not show any evidence of pneumothorax. The histopathology report was consistent with a hydatid cyst. Postoperatively, she received albendazole therapy. She is healthy without any evidence of recurrence after three years. Hydatidosis results from the deposition of the larval form of Echinococcus, a genus of tapeworm. The most common site of hydatid cysts is the liver, followed by the lungs (1, 2). The incidence of bone disease is extremely low as most larvae are trapped by the liver and lung upon release of the embryo into the portal blood stream (3). Of hydatid disease of bone, vertebrae and pelvis are the favoured sites (4). Osseous hydatidosis, especially when located in the rib, is a rare disease (5). Even in countries where echinococcosis is endemic, the chest wall is a rare site for hydatid disease (6, 7, 8). Only isolated sporadic cases have been reported in the literature (6). Hydatid disease of the chest wall can present as swelling, confusable with tumors or rib fracture, and if the first rib is involved, as thoracic outlet syndrome (9). In this case, it presented as a cold abscess, reported for the first time in the literature. The term ‘cold abscess' is a misnomer as it represents a collection of pathogenic organisms without any evidence of inflammation unless secondarily infected. The course of the disease is generally slow and laboratory tests are frequently negative in contrary to abdominal hydatid cysts (1,5). Interpretation of imaging studies can prove very confusing because bone changes evolve with time, and the non-specificity of these findings often leads to a mistaken diagnosis (3, 8). Radiographic findings of hydatidosis are rarely typical in bone, and only in a few patients can CT contribute to the diagnosis (10). On the other hand, the local extension of the lesion both in bone and in soft tissues, which is essential in planning surgery, is always demonstrated well by CT (10). The findings on CT can be confused with either tuberculosis or neoplasm (3). CT appearance of hydatid disease of the bone may show well-defined, single or multiple cystic lesions without any contrast enhancement, calcification, or germinal membrane detachment (11).The cystic lesion may show a honeycomb appearance, pathologic fracture, bone expansion, cortical thinning, cortical destruction, bone sclerosis, and soft tissue extension (11). In MRI, the cyst wall appears as a low signal intensity rim on T2-weighted images, and on T1-weighted images, a relatively high signal intensity wall with ‘folded parasitic membranes' (12). Daughter cysts may have low or high signal intensity depending on contents (12). Fine-needle aspiration biopsy is a safe diagnostic approach in the evaluation of suspected hydatid disease. The presence of acellular laminated membranes with or without evidence of hooklets or scolices confirms the diagnosis of a hydatid cyst (13). When polygonal pieces of acellular material with delicate parallel striations are seen, without scolices or hooklets, they most likely represent a sterile hydatid cyst (14). Fine needle aspiration biopsy aids in definite diagnosis and appropriate treatment planning. Diagnosis is generally made through combined clinical, radiologic, and laboratory data assessment (5). Chest wall hydatidosis requires surgical treatment, but recurrence is frequent (6). Operative procedures for chest wall echinococcosis are cystectomy, cystotomy and evacuation, and chest wall resection (7). The gold standard for therapy is radical removal of the involved ribs or chest wall (5). Treatment of osseous hydatidosis is closer to oncologic therapy than to the usual surgical treatment of visceral hydatid cysts (15). Because of the poor results with medical treatment, osseous hydatidosis must be treated by a radical operation with wide excision, adapted to each location (4). No recurrence has been reported with these procedures (16). The prognosis of osseous hydatidosis remains poor, especially when located in spine and pelvic bone. Prognosis and treatment of osseous hydatidosis belong to the same category as a locally malignant lesion (15). Accidental rupture of the primary cyst and spreading of scolices during surgery results in widespread hydatidosis of the lung, liver, and subcutaneous adipose tissue (17). Primary hydatid disease of the chest wall is extremely rare. Chest wall hydatid disease should be considered in the differential diagnosis of any chest wall swelling. One of the uncommon sites for echinococcosis even in endemic countries is the chest wall (18). Preoperative differential diagnosis of skeletal cystic lesions should include cystic echinococcosis, especially in endemic areas, since this diagnosis may easily be missed unless kept in mind. The striking resemblance between tuberculosis cold abscess and hydatid cyst of the chest wall clinically and radiologically forms a diagnostic dilemma, particularly in those with a history of tuberculosis. This case illustrates that in the absence of a high index of suspicion for echinococcal infection, the resemblance of imaging findings of hydatid disease in bone to those of other skeletal pathologies can lead to misinterpretation (3). Fine-needle aspiration biopsy is a safe diagnostic approach in the evaluation of suspected hydatid disease. 1. Ugras S,Sakarya ME, Arslan H, Bozkurt M, Akdeniz H. The diagnosis by fine needle aspiration biopsy of hydatid cyst of the pancreas. Acta Chir Belg. 1997 Oct;97(5):244-6. 2. Safioleas M, Misiakos EP, Dosios T, Manti C,Lambrou P, Skalkeas G. Surgical treatment for lung hydatid disease. World J Surg. 1999 Nov;23(11):1181-5. 3. Morris, Burzin S; Madiwale, Chitra V; Garg, Ashwin; Chavhan, Govind B. Hydatid disease of bone: A mimic of other skeletal pathologies. Case Report. Australasian Radiology. 46(4):431-434, December 2002. 5. Karaoglanoglu N, Gorguner M, Eroglu A. Hydatid disease of rib. Ann Thorac Surg. 2001 Jan;71(1):372-3. 6. Ben Miled-M'rad K, Bouricha A, Hantous S, Zidi A, Mestiri I, El Hammami S, Djilani-Horchani H, Ghedira H,Belhabib D, Megdiche L, Hamzaoui A, Kilani T. Ultrasonographic, CT, and MRI findings of chest wall hydatidosis. J Radiol. 2003 Feb;84(2 Pt 1):143-6. 7. Ozdemir N, Akal M, Kutlay H, Yavuzer S. Chest wall echinococcosis. Chest. 1994 Apr;105(4):1277-9. 8. Ayadi H, Msaed S, Ayoub A. A curious beating mass. Rev Pneumol Clin. 2005 Feb;61(1 Pt 1):41-3. 9. Gezer S, Altinok T, Agackiran Y, Tastepe I. Hydatid disease of the first rib causing thoracic outlet syndrome. Med Princ Pract. 2007;16(1):68-70. 10. Torricelli P, Martinelli C, Biagini R, Ruggieri P, De Cristofaro R. Radiographic and computed tomographic findings in hydatid disease of bone. Skeletal Radiol. 1990;19(6):435-9. 11. Tuzun M, Hekimoglu B. CT findings in skeletal cystic echinococcosis. Acta Radiol. 2002 Sep;43(5):533-8. 12.	von Sinner WN, Rifai A,te Strake L,Sieck J. Magnetic resonance imaging of thoracic hydatid disease. Correlation with clinical findings, radiography, ultrasonography, CT and pathology. Acta Radiol. 1990 Jan;31(1):59-62. 13. Saenz-Santamaria J, Moreno-Casado J, Nunez C. Role of fine-needle biopsy in the diagnosis of hydatid cyst. Diagn Cytopathol. 1995 Oct;13(3):229-32. Comment in: Diagn Cytopathol. 1997 Jan;16(1):93. 14. Ascoli V, Teggi A, Gossetti F, Nardi F. Hydatid cyst: primary diagnosis by fine-needle aspiration biopsy. Diagn Cytopathol. 1990;6(1):44-8. 15. Zlitni M, Ezzaouia K, Lebib H, Karray M, Kooli M, Mestiri M. Hydatid cyst of bone: diagnosis and treatment. World J Surg. 2001 Jan;25(1):75-82. 16. Sagin HB, Kiroglu Y, Aksoy F. Hydatid cyst of the breast diagnosed by fine needle aspiration biopsy. A case report. Acta Cytol. 1994 Nov-Dec;38(6):965-7. 17. Bozkurt AK,Yavuz N,Yuceyar L Subcutaneous hydatidosis due to iatrogenic spreading of cystic fluid during surgery. J Cardiovasc Surg (Torino). 2001. 18. Karapinar K, Altinok D, Cetingok U, Duzgun C. Primary posterior chest wall echinococcosis. Int Surg. 1999 Jan-Mar; 84(1):89-90.